§ 202.16 Preregistration of copyrights. The Copyright Office publishes a multitude of circulars on registration. Most are devoted to aspects of registration for a particular medium. “[I]n 1996, [Batjac] attempted to register a claim to unlimited copyright in the screenplay for [Batjac’s 1963 movie] McLintock!, but the Copyright Office refused to register the claim. All relevant copyrightable interests in the screenplay, the Copyright Office determined, had fallen into the public domain when the copyright in the motion picture of McLintock! expired. “The district court [held] … that the Register had thus properly refused petitioner’s application to register the screenplay for copyright. The court held that the screenplay, as a component of the motion picture, had been published by the general publication of the motion picture, and that the screenplay had been protected by the motion picture’s copyright. Accordingly, when the copyright on the motion picture expired and the movie fell into the public domain, the district court held, all elements of the screenplay that had been incorporated into the motion picture fell into the public domain as well. “(a) Definition. Cancellation is an action taken by the Copyright Office whereby either the registration is eliminated on the ground that the registration is invalid under the applicable law and regulations, or the registration number is eliminated and a new registration is made under a different class and number. “(3) An existing registration in the wrong class is to be replaced by a new registration in the correct class. Under the 1976 Act, the passage on registration doesn’t specify time limits, but does state (as do the earlier Acts) that registration must precede any infringement suit. For pre-1978 works: “An original registration can be made only during the first 28-year term of copyright protection. However, it is possible to make both an original registration and a renewal registration during the 28th year of the copyright term. 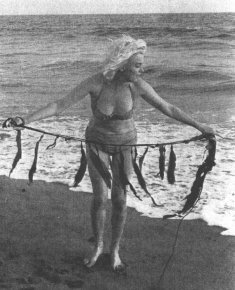 Photographs of Marilyn Monroe (1926-1962) bore 1962 copyright notice when published that year, but because they were not registered for copyright, they enjoyed only common-law copyright. The 1976 Act allowed for late registration of works still in their first term, so in 1986 the copyright owner took advantage of this provision by taking out copyright registration that year. Because 1962 was the year of publication, the first term ended in 1990. The copyright was not renewed, so the copyright didn’t protect the photographer’s rights beyond 1990. 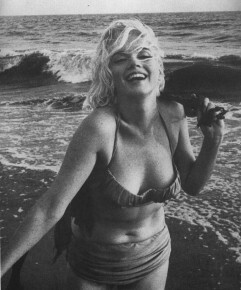 Barris offered as additional supposed proof his copyright registrations for two books (Marilyn, from 1986, text by Gloria Steinem, photos by Barris; and Marilyn—Her Life in Her Own Words: Marilyn Monroe’s Revealing Last Words and Photographs, from 1995, text and photos by Barris), but the judge did not see the relevance. Presumably, the judge recognized (without stating so) that at most these copyrights applied to the new matter and not to the previously-published photographs. illustrations: Of the four Barris photographs used by Hamilton in his collage, one (left) also appears (albeit with Barris’s authorization) in the book Marilyn (text by Gloria Steinem, 1986), pg. 163, and another photo (right) appears in Barris’s book Marilyn—Her Life in Her Own Words: Marilyn Monroe’s Revealing Last Words and Photographs, pg. 146. Although the other two photos used by Hamilton are obviously from the same sessions as some similar Barris photos in the two books, the comparable pictures in these books are different exposures and poses than the two others used by Hamilton. Richard Hamilton’s collage, titled My Marilyn, is often available online from art-print dealers who post on their sites an image of the collage. A Google search on "Richard Hamilton" "My Marilyn" should reveal any at the time of your search. The 1976 Act allows corrections to copyright registrations. D.C.N.Y. (1-28-1913) ¤ 214 F. 272. A playwright copyrighted her play under one title (A White Slave’s Love), then allowed it to be produced under another (The Undertow). An infringer who knew the facts was not entitled to violate the copyright on grounds of lack of copyright under (or attribution to) the second title. NBC Subsidiary (KCNC-TV), Inc. vs Broadcast Information Services, Inc. (launch this) documents the plaintiff’s attempts to correct a copyright registration that when first filed left out the date of first publication. “The filing fee for processing a claim to supplementary copyright registration is nonrefundable, whether or not copyright registration is ultimately made.” (Information Circular 8) The cost is considerably higher for supplementary copyright registration than a standard registration. Caliga vs Inter Ocean Newspaper Co. In examining an infringement suit, a lower court had discovered two copyrights on the same photograph of a painting, and inasmuch as the second copyright was the one named in the suit, the court decided that this was not the copyright that the trial should proceed on. The Supreme Court decided only on the aspect having to do with the duplicate registration. Bouvé, Register of Copyrights vs Twentieth Century-Fox Film Corporation (launch this) had the Register of Copyrights insisting that twenty articles in periodicals be registered as twenty separate copyrights rather than as one collection as the claimant wanted.